Halfway between winter and spring equinox, the plum flowers will start to blossom across Japan. The 88th day of spring marks the first day of tea leaf picking for a new season, and the leaves of this harvest fetch high prices. 210 and 220 days from the beginning of spring are pegged as days that typhoons will most likely come, causing much dismay to farmers. 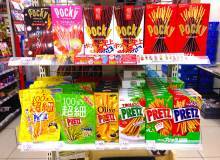 While it may sound like a parody, since ancient times, Japan has taken seasonal cues from the natural calendar. 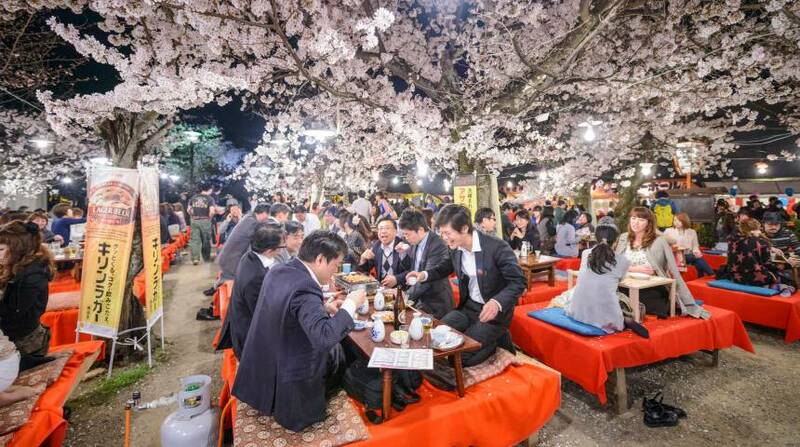 This is particularly evident in cuisine, meaning that if you’re in Japan during the spring months, you can look forward to a special selection of things to eat and drink. 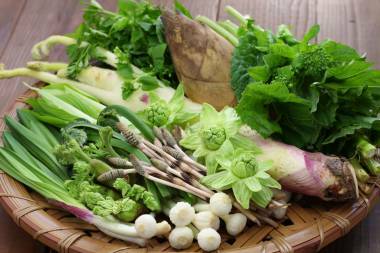 sansai are often used as ingredients in shojin ryori(buddist vegetarian cuisine). These are the wild mountain vegetables that poke their welcome heads out as soon as the snowy blankets and chill of winter start to give. Sansai are usually bitter and provide timely astringence to break down fat and toxins stockpiled through colder months. The most common types include takenoko (bamboo sprouts), taranome (Japanese angelica-tree roots), fuki (butterbur) and nanohana (rapeseed). Since the Heian period, spring’s blossoming sakura trees have been cause for celebratory picnics, drinking, dancing and general frivolity. Hanamizake is sake served with sakura petals added to it, making a fittingly darling drink for blossom appreciation festivities. In other parts of the world, glasses of sweet Pimms, crisp cider and chilled rosé are guzzled in spring-has-sprung glee. In Japan, special-release spring beverages bring this seasonal titillation through floral, pink and vine-draped packaging, and in-theme flavor profiles. Special spring-release sakes are aromatic, bright and elegant. Many come tinged pink from ingredients such as red shiso, red rice koji, ancient purple rice, or flower petals combined with the brewing mash. Spring beer varieties are fragrant and slightly bitter, and may also be colored and flavored with flowers and seasonal fruit like cherries, strawberries and plums. 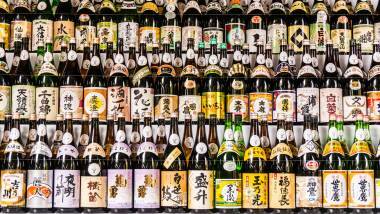 Large collection of Japanese sake bottles with multiple colored labels arranged on shelfs taken at temple in Tokyo. Traditionally, the sake brewing season takes place between late autumn and spring, following the summer rice harvest. The first batches are pressed around December and set aside to age. 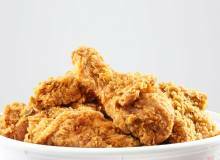 This process rounds and mellows out flavors, and can take 6 to 18 months to complete. Shinshu, however, is sake that is pressed and sent straight to market without any maturation. These brews bring mouthfuls of spring vitality with their characteristic youthful liveliness and fresh, zingy taste. Although in abundance all year, the varieties of seafood to look out for in spring include sayori (halfbeak), sawara (Spanish mackerel), nishin (sardine), mebaru (rockfish), madai (red sea bream), hatsu-gatsuo (spring bonito), shirasu (baby sardines), sazae (turban shell), various clams like aoyagai (surf clam), akagai (red clams) and asari (littleneck clams), Ise ebi, kuruma ebi, hotaru ika (firefly squid), hamo (conger eel) and kazunoko (herring roe). Along with blossoming sakura and sprouting wild vegetables, the ocean’s garden comes into bloom during spring. March and April are the time to sample fresh (as opposed to the dried and preserved versions available year-round) seaweed varieties like wakame, hijiki, mekabu and mozuku, when the waters are warm and the sea vegetables flourish before withering in summer. Try these nutritional powerhouses in soups, salads and tempura. Girl’s Day, on March 3, is a day when families pray for the health and happiness of girls. It involves consuming: hisamochi, a pink, white and green diamond-shaped rice cake; arare, colorful sweet puffed rice; ushiojiru (clam soup); and amazake, a sweet and non-alcoholic rice drink. 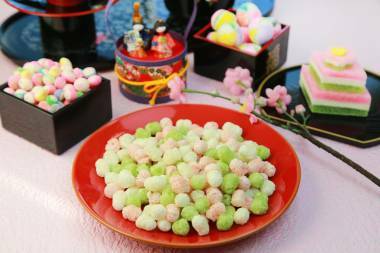 For shunbun no hi—spring equinox, this year on March 20th—botamochi, sweets of chunky, sticky rice wrapped in red bean paste, are eaten. Celebratory food for Children’s Day on May 5 includes chimaki, sweet or savory steamed sticky rice cakes wrapped in bamboo leaves, and kashiwamochi, mochi filled with red bean or white bean and miso paste and wrapped in an oak leaf. An increased amount of “shuwa shuwa” (effervescent) sake also hits the market in spring. The refreshing fine bubbles, sweet and sour taste, and lower alcohol levels of the drink make it a popular option for sipping away balmy afternoons. Sakura mochi (cherry blossom dumplings), kusa mochi (grass dumplings), ichigo daifuku (strawberry dumplings), usugi mochi (warbler dumplings). 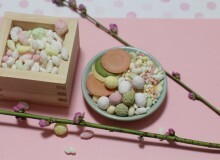 These are some signature springtime wagashi, a traditional and highly decorative type of Japanese sweet that draws heavily from the seasons for inspiration. 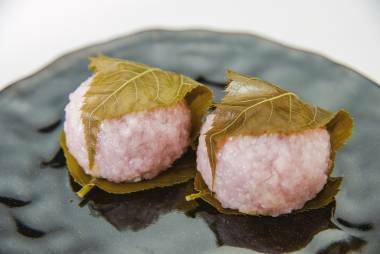 Sakura mochi are small balls of pink-tinged rice filled with red bean paste and wrapped in a pickled sakura leaf. Kusa mochi are soft sweet rice cakes with mugwort, a seasonal herb, kneaded into the dough. Ichigo daifuku are rice cakes filled with bean paste and seasonal fresh strawberry. Usugi mochi are small mounds of bean paste wrapped with a very soft, sticky type of mochi and dusted with green soy bean flour, to evoke an image of a bird hiding in greenery.